I have heard grace defined so many times that I struggle to remember each one I have heard. The most popular definition is “unmerited favor of God”. But I have also heard it described as “God giving you what you do not deserve”. The term “grace” is also used to describe a person’s actions and behaviors. The word “grace” has been used in conversation in the place of prayer – “Would someone like to say grace?” Grace is also used as a name. But what should grace be in our life? And how in the world does it relate to this Bible verse? 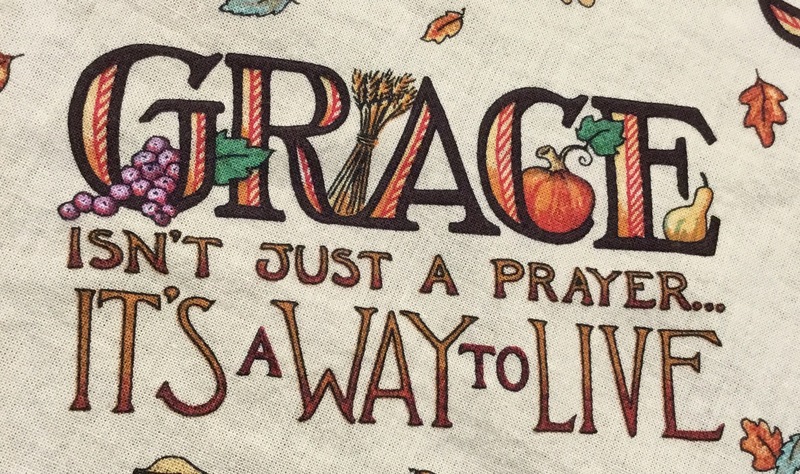 How is grace a way to live? We do not deserve what God has given us in our life. We have blessings in abundance even on the hardest of days. We have the opportunity to spend eternity with Jesus despite our constant and devious desires to do things that are wrong. We do things out of duty rather than out of love. We moan and groan when things don’t go just as we had planned. We do not deserve what God has given us in our life. Yet, He has given us the opportunity each and every day to put away the old things that may have gone on yesterday. Each day is a clean slate, a new opportunity. Each day should be seen as a challenge to truly put away all those old ways and truly become new. And grace plays a part in all of this. Grace is remembering what God has done for you and living your life in newness so that you might, in some small way, say thank you. You can’t earn grace. You can’t buy grace. You can’t construct grace. Grace is one of those beautiful gifts that you have to accept by faith. It just is. So this weekend, as you notice the chill in the air and see the newness of color in the leaves or just appreciate a slight decline in the temperature, remember grace. Remember the beautiful, free gift that it is and the fullness it has to offer you in your life. Live life in grace. Think back with me for a moment to the time when the love you have with your spouse or significant other was new. Remember how wonderful it felt? Do you remember thinking that if you two stayed together that it felt like there was nothing that you couldn’t overcome? Do you remember your every thought was consumed by him/her? When you weren’t together, you wondered where they were and what they were doing. You could spend hours on the phone with them just talking about the day. Do you remember how the tiniest gesture of love sent you into a tailspin and you felt like one of those cartoon characters with hearts in your eyes? Yep, those were the good old days. Now then, when was the last time you felt that way about the True Love of your life, Jesus Christ? Because, you know, that without Him, you would have no idea what that feeling was in your heart toward your spouse or significant other. You wouldn’t know how to love him/her. Jesus is the One that showed you what real love is. He is the One that keeps showing you how to love. But that’s not what I want to focus on today. I want us to look at living like we are loved. I heard that phrase in a song yesterday and it has stuck with me and made me think – do I live like I’m loved or do I live like I’m not? When I first entered into my relationship with my husband, everything was bright and new and wonderful and fascinating. We could talk for hours on the phone when we were apart. We asked questions of one another and really got to know one another. Now, we have been married for 22 years. There’s not too much that I don’t know about him. Every now and again, I might learn something new, but for the most part, we are an open book to one another. Yet still, everything is still bright and new and wonderful and fascinating – but in a whole new way. We are learning to live each part of our life in love that is sustained because of our relationship with Jesus Christ. Some people have a tendency to live life defeated or downcast. They fail to see the newness of each and every day and they choose to turn their eyes from the promises of God. I’m not sure why or how they do this. But they live their life like they have no real love. And these are people who proclaim to be followers of God. Actually, I question the truth in that statement. So what does it mean to live like you are loved? 1) I think that it means you have a desire to grow your relationship with Jesus. You have the desire to get into His word and learn more and more about Him – even through the challenging and seemingly redundant parts – there is still something there for you to learn about Him. 2) I think that it means that you have the desire to spend more time with His people. You want to attend services. You want to have friends that believe like you do. 3) I think that it means that you want to talk to Him. You want that ongoing dialogue. It brings you peace and comfort. 4) I think that it means that you want to do as much for Him as you can. You want to show Him that you love Him too by serving Him and His people. Living like you are loved brings peace and real joy to your life. It lets you know that you are exactly where you need to be despite what may be going on around you. Life isn’t always going to cooperate. Dark days are going to come and the devil will throw darts at your heart. But living like you are loved makes those challenging days more bearable because you know that you don’t face them alone. I was driving along the other day and I heard a guy on the radio make this statement. Now, the guy that said it, I wouldn’t trust him as far as I could throw him. But, the statement in and of itself is really good. How will you live life after today? You have no idea what today holds. You have no idea if you will even wake up tomorrow, let alone follow through with the plans you have made. Yet, all week we think and plan for the weekend. It’s our time off (for some). It’s when we are “free”. Do you ever stop and consider eternity? Do you think about what it will look like, who will be there or what you will do? Some of my family is already experiencing eternity. They are living life after today. I don’t have a ton to say on this today. I’m just planting seeds. Let me encourage you to take some of that “free” time and consider eternity for a bit. If you don’t understand or know where you will spend eternity, go check out my other page for the plan of salvation. It’s so easy and so worth it. Don’t think about life after today without Jesus in it. We all like our stuff. We have so much, yet we want more. We work all day for stuff. We save and scrounge just so that we can have a certain kind of stuff. We want our stuff to look nice. We want our stuff to be new. We want our stuff to be full and ready at a moments notice. We like our stuff. But this verse warns us about “stuff”. Stuff can overtake our thoughts and desires. Stuff can actually become a god to us. We look after it and focus on it more than we do our Heavenly Father. That’s where the problem comes in. Anything we put before God is an idol. We have idols in our family, in our job, in our stuff – oh yeah, it’s there! Our love of stuff is the part of the problem. Our desire to have more goes right along with it. You see, stuff, in and of itself, is not bad. Stuff can sometimes be good. But it is our attitude toward it that is important. “I just need to work during a few church services and then I can pay off that new thing I got.” “That movie kept me up so late, I’m just too tired to get up and read my Bible this morning.” Sound familiar? I’m just as guilty as the next person about putting other stuff in front of God. It’s a challenge. I know. Our greatest possession should not be something we have worked for – it should be our relationship with Jesus Christ. “Stuff” will not get you to Heaven. Only Jesus Christ can do that. He’s the One you need to get to know better. He is the One we need to invest our time in. He’s the One we need to make a priority in our life. So as you enjoy all your stuff this weekend, make sure that your attitude toward them is correct. You could wake up one morning and it could all be gone. But you will never wake up and find Jesus gone once you have accepted Him as your Savior. That’s a possession you will never lose. That’s the “stuff” life is made of! I was listening to the lessons last night at church and one theme kept coming to mind – on purpose. Do we do things on purpose? Most of the time, I feel that I’m “rolling with the punches”. Sometimes that’s necessary. Unfortunately, my rolling is more like the rolling of a square tire – it’s not pretty but it is possible, with a lot of work. But I shouldn’t do that. I need to be living my life on purpose, even through the rough spots. When I cook, every ingredient has a purpose. There is a time to put it into the mix that creates exactly what it was meant to create. When I do it out of order, it doesn’t turn out right. I have to do each step on purpose. In these verses today, we see how to live a life that we can love – a life pleasing unto God. 1) Hold your tongue – Don’t speak evil against others. Don’t cut them down. Don’t say things to hurt others. Watch what you say. Now, if that doesn’t require purpose, I don’t know what would. It takes thought and effort to allow God to guard your tongue. Sometimes life is rolling along and wham! Out flies something that you wish you could take back. Unfortunately, once it’s out there, it can never come back. Guard your tongue. 2) Go away from evil and do good. This seems obvious, right? But is it? Satan makes evil look good. He disguises the wrong in the cloak of goodness. And it’s not until your knee deep in it that the cloak comes off. Sometimes it is hard to distinguish right from wrong because of that cloak. This is why it is so important to purposefully ask God what you should do. Living life on purpose means finding out the truth – knowing good from evil and seeking after the good. 3) Go after peace – This is definitely a choice. Peace requires purpose and determination. It is so easy to seek revenge when we are wronged, but that’s not what God would have us to do. We have to purpose in our heart to go after peace and not let the hardships and problems drag us into the pit of dispair and unrest. This is all about decisions. Decisions to live life on purpose. Decisions to choose God’s way above our own. Decisions to roll like a round wheel and not a square one. I am planning to write this week about doing things on purpose. God laid it on my heart last night to stop flying by the seat of my pants when it comes to my spiritual life. I need to purposefully choose each and every day how and when to live out His purpose in my life. And it starts with recognizing the problem. I invite you to join me in learning to live on purpose. So we talked about these verses in Sunday school yesterday. I was trying to get the kids to understand what these verses really meant. Now, I know that these verses were written in regards to service within a local New Testament church, but I feel that they also have a personal application. Every sculpture has a base – something it is built upon. Your life’s sculpture is built upon Jesus when you accept Him as your Savior. You build your sculpture with all kinds of things – silver, gold, precious stones, wood, hay and stubble. The actions, thoughts and words you speak that are positive and glorifying to God build parts with silver, gold and precious stones. The actions, thoughts and words that you speak that are self-glorifying and negative build parts with wood, hay and stubble. We build with all those materials every day – all of us. But at the end of your days when you stand before the Judgement Seat of Christ, what will your sculpture be built of primarily? You see, at this Judgement, all of our works will be tried by fire. Our life’s sculpture will be placed in God’s holy fire and only the good stuff will come out. What will your sculpture look like? Will it be beautiful and abundant or will it be small and puny? You see, this is what your gift to God will be. It will be a life’s work that will show Him how you truly lived your life (not that He doesn’t already know). This sculpture is how you will be rewarded. It shows what really went on. In this life, you can make your actions seem pure and righteous, but God sees what you are really building with. And in that fire, so will you. So, what are you building your life’s sculpture with? How will it withstand the fire? What will your gift to Him truly be? Yes, I know, I’ve already said something about this verse. But it’s so good!!! We have had a busy week at my house. We have had several appointments and such that we are chasing our tails! And to top it all off, the kids are winding down school. So, now comes the onslaught of final projects and tests. And next week doesn’t look to get any better. We have tests, book reports, cheerleading, soccer, orthodontist appointments and who knows what else going on next week. And the week after that is finals and preparing for our family vacation – which, by the way, we leave the day after their last final. Fun, fun stuff! Oh, and I forgot, I still have to go to work and work at home as a wife and mother. Work. It is every where in every thing. We have to work to keep our sanity, work to keep every one clothed and fed, work to keep our house from becoming a pig sty, work to keep our health in the right place. Work. Work. Work. Life is hard work. We want to think it will be easy once we reach some point. But it’s not. Older people work just as hard as younger people, just in different ways. But how much of our work is done for the glory of God? Can you really glorify God in all those scenarios I mentioned above? I believe you can. God can be glorified in my meeting my obligations on time. God can be glorified in my choosing to eat healthy. God can be glorified in one of my children receiving a bad grade on a math test. God can be glorified in me attempting to keep my house neat. God can even be glorified in me making chocolate chip muffins for my kids for breakfast. Paul reminds us that it doesn’t matter what you do, even the menial tasks, to do it all for the glory of God. We think that some tasks are too simple and too ordinary to glorify God with. Oh no! Don’t ever demean the task of muffin making! You are pouring your love into those little baked delights. You are thankful that you have the finances to purchase the ingredients to make those yummies! You rejoice in the smile of satisfaction on their face when they take the first butter laden bite. You see, the devil wants us to compartmentalize God. If we put Him in categories or put His approval in categories, the devil has more control. The devil gets to say what God wants and doesn’t want. The devil gets to say what makes God happy and what doesn’t. And we all know where that can lead – trouble! God’s approval of us in only in one category – our obedience to Him. When we are being obedient, He is controlling our thoughts and our actions. He is controlling our attitude. And when we allow Him to give us the attitude of gratitude, our life changes. So let me encourage you, starting today, to do it all for the glory of God. Everything! Every single thing you put your hands to do. Every single word that comes out of your mouth. Every single thought that pops into your head. Do it all for the glory of God.